JJC OZ Series Neoprene Protective Wraps are perfect for covering your camera or zoom lens and keeping it safe in whatever bag or rucksack you are using for the day for hiking or outing. Soft neoprene interior won’t cause any scratches and nicks to the wrapped devices. The adhesive hook-and-loop fasteners are designed for an effective layer of protection when tucked in a bag or set aside for storage. The neoprene wrap conforms to a variety of shapes. The carrying case is included in the package to store the wrap. 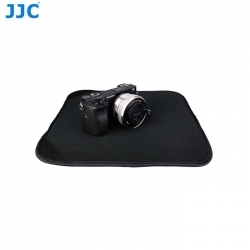 JJC OZ Series Neoprene Protective Wraps are available in 3 colors: black, camouflage gray, and camouflage gray. And the wraps are also available in 3 sizes: 12, 16 and 20 inches square. Tips: The full exteriors of OZ-1BK, OZ-2BK and OZ-3BK feature small and hairy loops which can firmly attach to any one of the two hooked corners. However, the other warps are only equipped with two hook-and-loop fasteners. -OZ-1BK, OZ-1A, OZ-1B, OZ-2BK can cover and wrap iPad and iPad mini. -OZ-2A, OZ-2B, OZ-3BK can cover and wrap iPad mini.